Today was a beautiful day when I left for work, but by the time I was able to railfan if I wanted to, the clouds had blown in and I figured I’d better work on some of my projects at home. So this post will be based on photos already in my collection. I decided to post today about unique freight cars you can model using factory produced cars, without much extra effort. Because my favorite car type is the covered hopper, I have a lot of covered hopper photos in my collection. Over time, I’ve captured a lot of cars I would someday like to have the ability to model, and a few that I could model without having to first custom paint an entire car. When I first got into N scale model railroading, I bought more covered hoppers than anything else. I seem to recall that this was because of the dearth of (modern) covered hoppers that existed in O scale at the time (circa 1998-1999), as well as the fact that my earliest memories of trains came from when the local shortline switched the grain elevator behind the house we lived in at the time. I also enjoyed the variety of paint schemes that could be found on these trains, which I believe gives many covered hopper unit trains much more character and variety than a similar coal or even boxcar unit train (yeah, I don’t see many boxcar units trains either, but that’s not the point). Many of the covered hoppers I purchased in my early years of N scale were produced by Atlas. 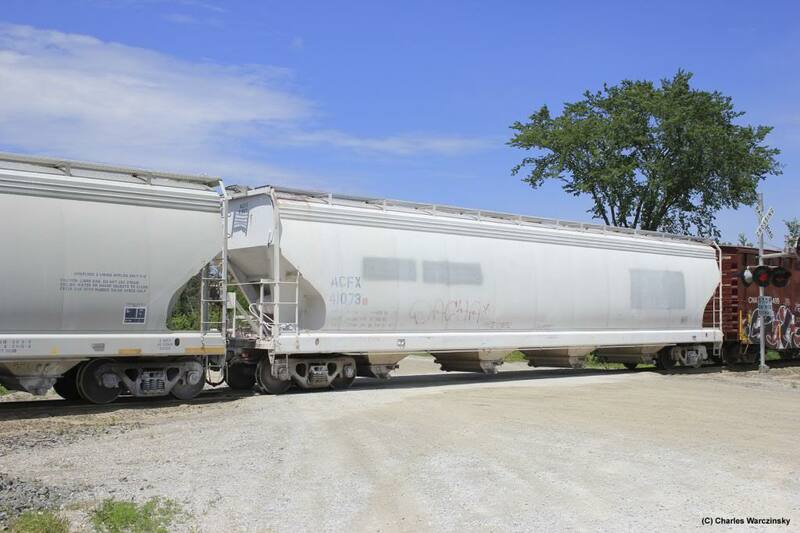 I believe these were painted mostly in grain-related paint schemes, although the car body Atlas used was set up for a different type of cargo than grain. Until recently though, I didn’t care much about the hatches on the bottom of the cars as they were far better than the covered hoppers I’d been able to afford in O scale. Truth be told, I still don’t care that much about the difference because the cars still look pretty good in a train. One of the first cars I remember purchasing that wasn’t a grain car was an ECC America car. It was a white car with blue letters. Fast forward several years into the future and a couple ACFX covered hoppers caught my attention- the gray patches on the white car appeared to be in the same spots as the Atlas E.C.C. America car was painted. Modeling these cars as is wouldn’t require a whole lot of work, just a couple of gray patches over the ECC America decorations. The car numbers do not appear to have changed since the cars were leased by E.C.C. America. I caught an additional car where the patches had faded enough to actually make out what the blue ECC paint. I chose this car (not pictured, sorry) to base my model on and gave it a nice coat of gloss white (spray) paint, not intending to cover the car, just to tone down the decorations enough without losing all of the decorations. Unfortunately, I got the paint on a little heavy, but the car still looks pretty good. At this point I think I’d better note that none of the models I mention in this post will appear in this post in photo form. My N scale “collection” isn’t exactly in the most accessible location currently, and I don’t have any way to get decent photos of the cars I’m describing. As I discovered while writing this post, Atlas no longer lists most of their releases prior to 2000 on their website, which would have been my point of reference for the Atlas models. Moving on, I’ve developed a particular appetite for the covered hopper fleet owned by The Andersons, reporting mark AEX. Not long ago much of their fleet still wore past owners’ paint, with just AEX reporting marks patched over the old reporting marks, and new car numbers where necessary. The Andersons apparently have invested some money into the appearance of their fleet as more and more often the AEX cars I see have had fairly fresh white, gray or oxide red paint schemes. 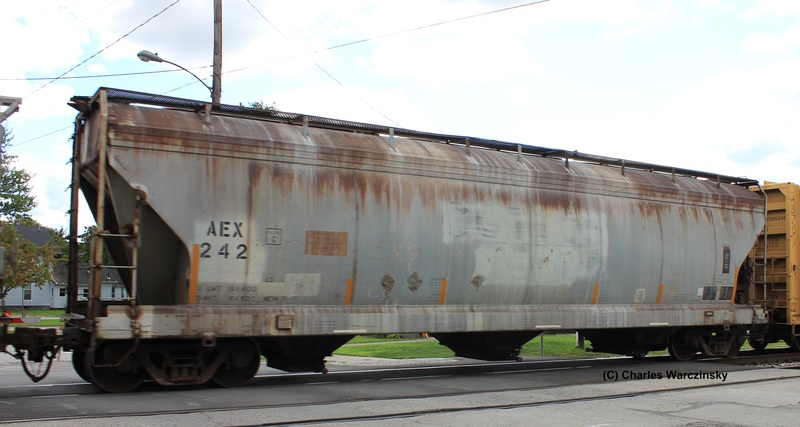 One of the cars I found in my collection of photos was AEX 242, which at one time apparently belonged to the Cotton Belt. While I’m pretty sure Microtrains made a car like this, I wasn’t able to find an example. Intermountain, on the other hand, has a photo that looks pretty close to the AEX 242, except with Cotton Belt/SSW decorations. Modeling this car would be a bit more difficult than the ECC America car, but not impossible. Part of the challenge would be finding the car, at an affordable price. The Intermountain cars can get a little pricey, making it more difficult to model on a budget. I also find it hard to do much to the more expensive Intermountain cars than the cheaper Atlas and Bachmann covered hoppers. On the other hand, if you’re not afraid to get the car dirty, some rust on the top and upper sides of the car, and a light overcoat of light gray paint (applied with a brush, not a spray can) could result in a nice looking car. Finishing touches would include A E X and 2 4 2 dry transfers applied to each side of the car as well as a very, very light overspray of grimy black or rust paint to add to the car’s weather beaten appearance. 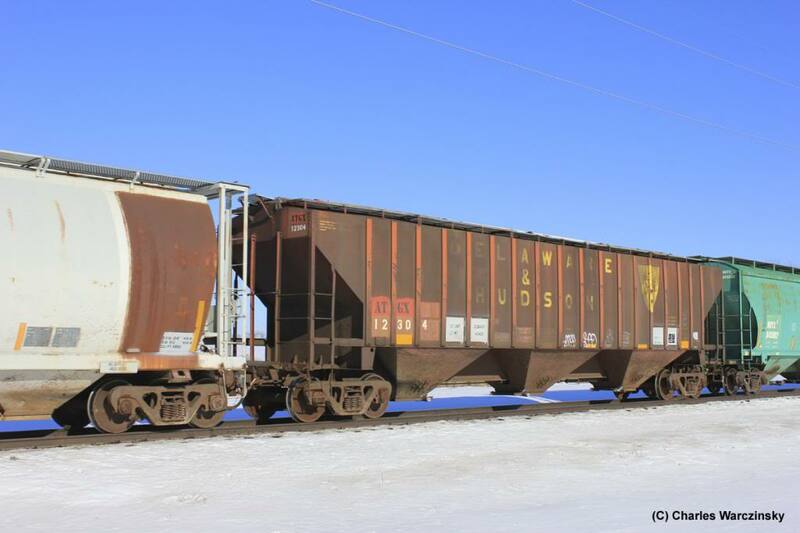 Intermountain also produces a Delaware & Hudson covered hopper that could be the starting point for an ATGX covered hopper project. http://www.intermountain-railway.com/n/html/65309.html. This is a darker version of a car I first spotted in Toledo, Ohio, a couple years back. The car in Toledo wasn’t photographable, but I came across this example a few months ago in north west Illinois. I would start with a coat of dullcote, followed by an overspray of grimy black, applied heavier in some places than in others, followed by a quick wipe of the side posts (to remove some of the dark paint) before the paint dries. A red patch over the D&H reporting marks and ATGX dry transfers would complete most of the major work on the car. If desired, additional patches of white or light gray could be applied, with car data decals applied over the patches. A final coat of dullcote should be added to seal all of the details in place. 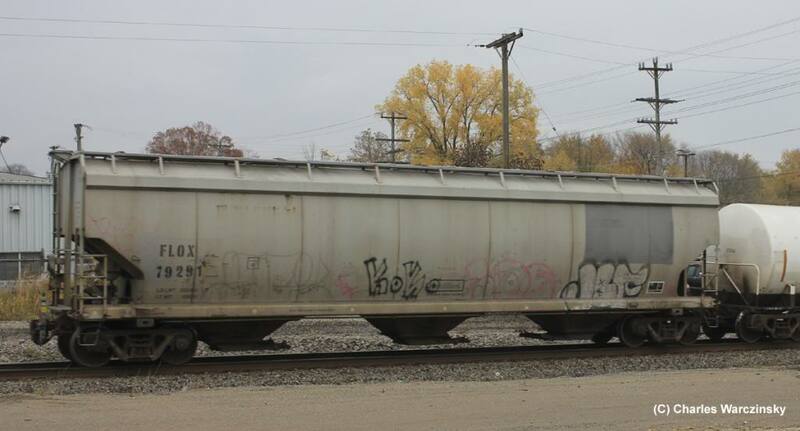 The final car I found that can be found rolling around today, is this Canadian National covered hopper car. This car could be represented by a Bachmann covered hopper, fairly easily. Bachmann made a car that looked a lot like this one, although I believe the Bachmann car had four bays, not three. I’ve also seen a variation on this car, with different reporting marks, which CN likely sold and the new owner(s) applied only a patch over the CN marks. First, FLOX 79291 has a patch in the appropriate place to be covering the CN logo, but the patch under the reporting marks isn’t obvious at first glance. FLOX 79227’s patches are much more faded than the 79291’s and the heritage of the car is much more readily apparent. I also ran across a couple of First Union cars (FURX) that look similar to these CN and FLOX cars, but which do not show any sign of having had the CN paint. 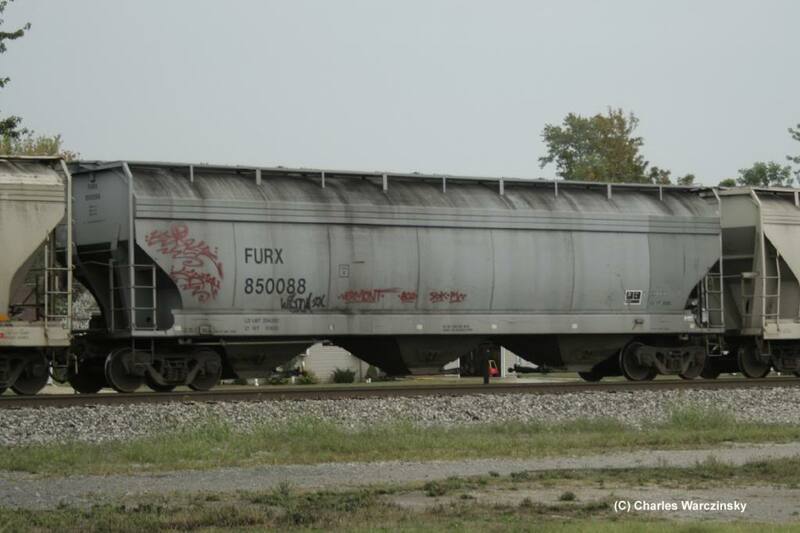 I decided to include one, FURX 850088 though as the gray paint reminds me quite strongly of the CN car. In the future I’m hoping to pull together a few more selections of covered hopper photos. All together I’ve taken thousands (yes, plural) of shots of these cars and I’d like to share some of my observations about different the photos in my collection. As this post concludes, I’d like to take a minute to address several of the comments I’ve received on this site lately. This pertains mostly to the SEO marketing comments I’ve received, and expect to continue to receive. Let me be crystal clear- this site is NOT intended to be a sales pitch, marketing ploy or profit center. I don’t care if your company can boost my web traffic, improve my search rankings or get my site good reviews. If you’re selling something, keep it moving. I don’t care and your spiel will be deleted. IF I want SEO on this site, I’ll do it myself. It’s not rocket science, that’s why everybody’s trying to sell it (well, almost everybody- in my day job, I tell people how to do it themselves and save some $$$). Until then, please save yourself the time and move on.